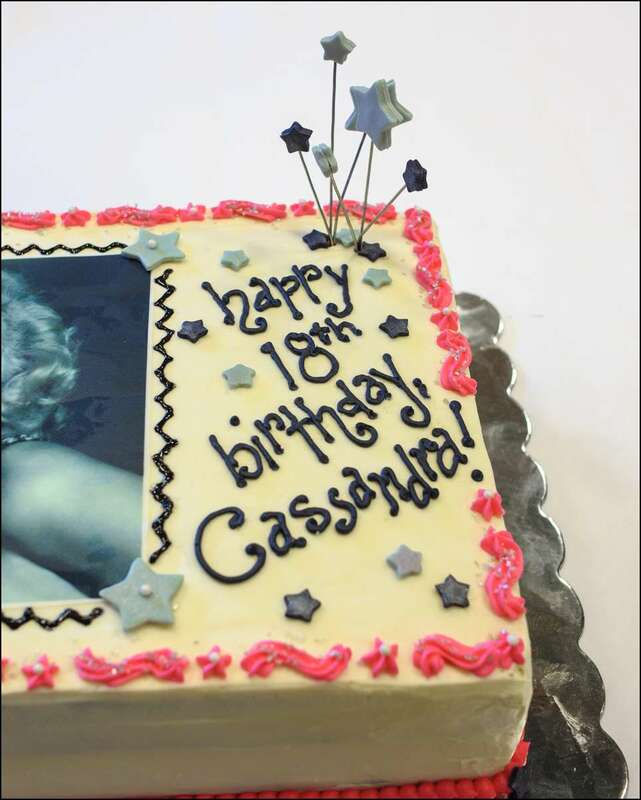 A client requested a birthday cake for her daughter who turned 18 last weekend. 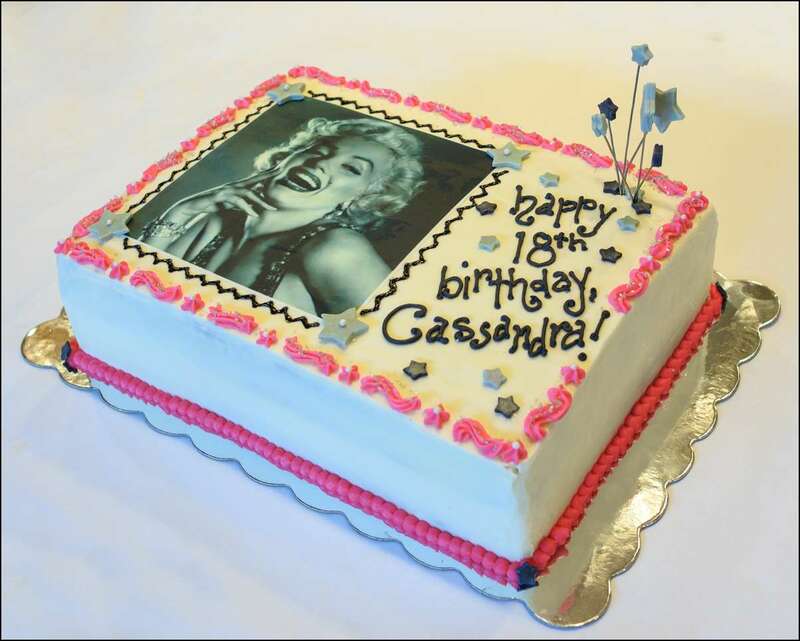 Since she (the daughter) loves Marilyn Monroe, we decided on this design to evoke retro Hollywood. 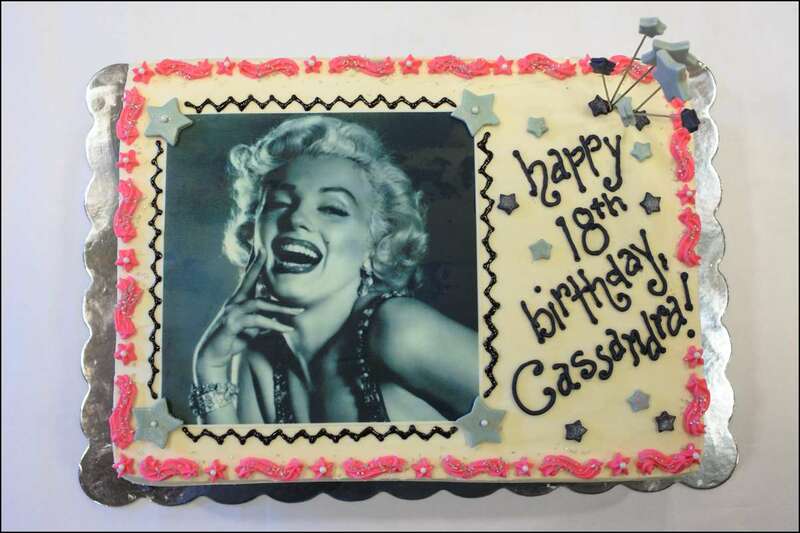 The edible image of Marilyn Monroe is printed on an icing sheet, which lends itself well to the black and white photo. 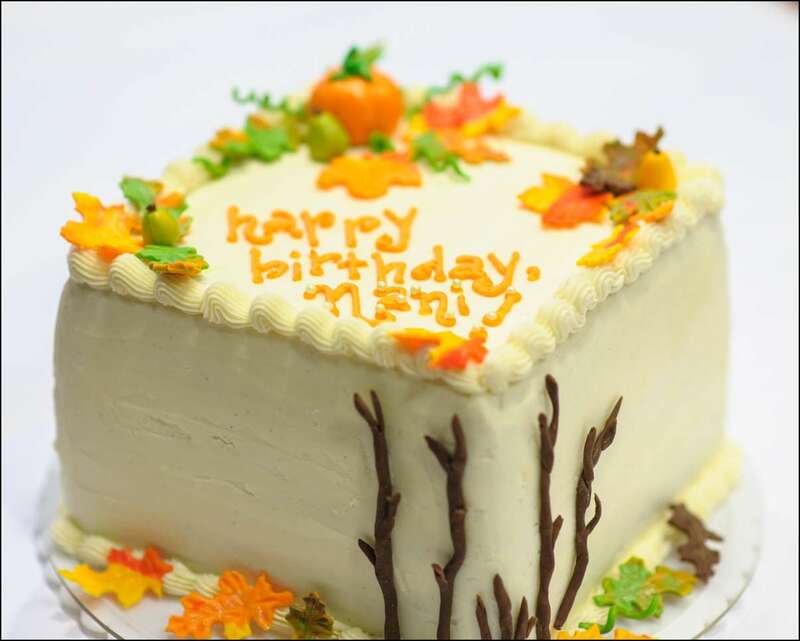 The cake is a 15″x18″ 2-layer cake (double-chocolate and confetti) covered in caramel buttercream and decorated with black and silver fondant stars, white pearls, and silver sanding sugar. I’ve got to say, I haven’t met many 18-yr-olds who are interested in iconic Hollywood stars. It’s refreshing to find one with such unique taste! 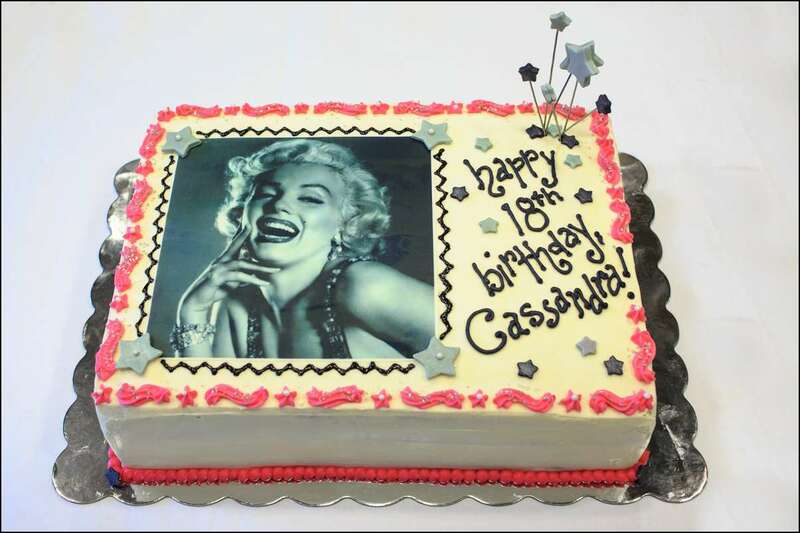 Hope you had a great birthday, Cassandra, I really enjoyed designing your cake! 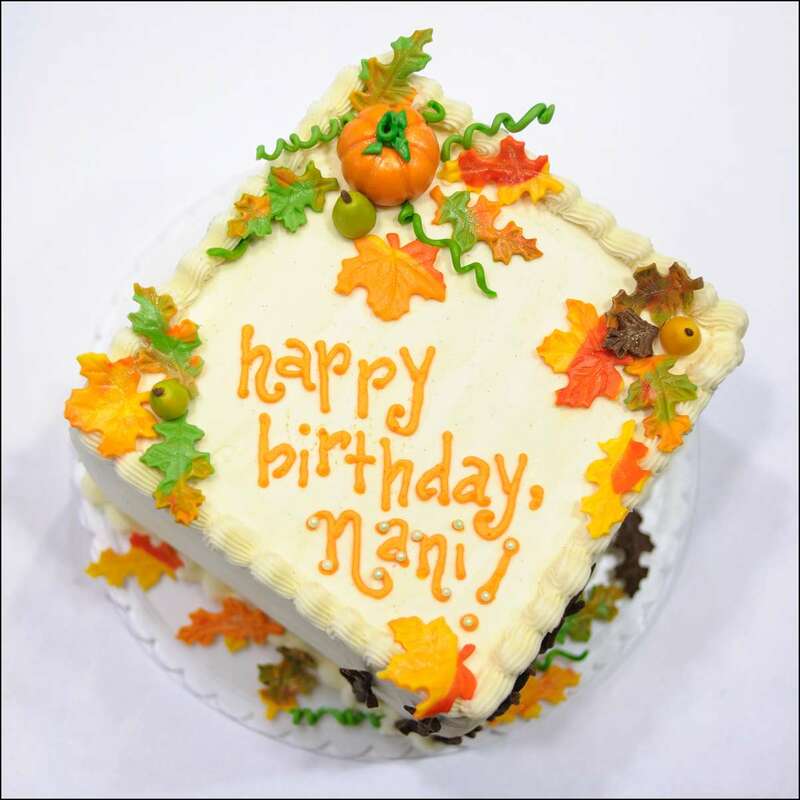 My dear Mother-in-Law (affectionately known around here as “Nani”) had a birthday this month and I wanted to do something special for her. 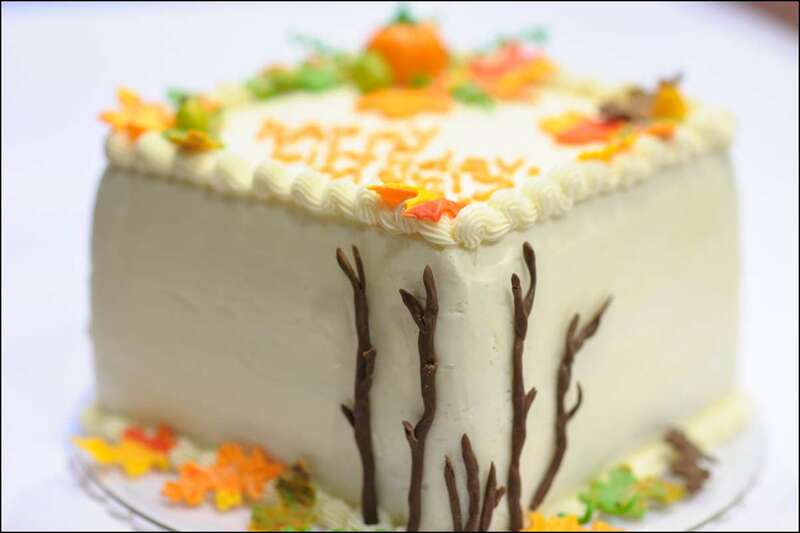 Since Autumn is her favorite season, I used that as my inspiration. 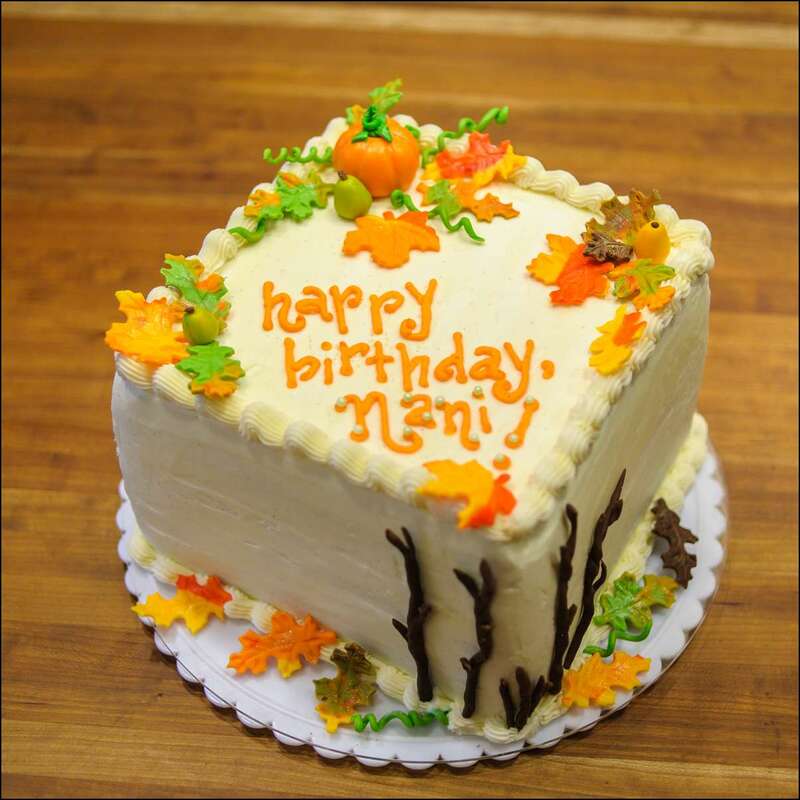 This is an 8-inch square double-chocolate cake frosted with salted caramel buttercream. 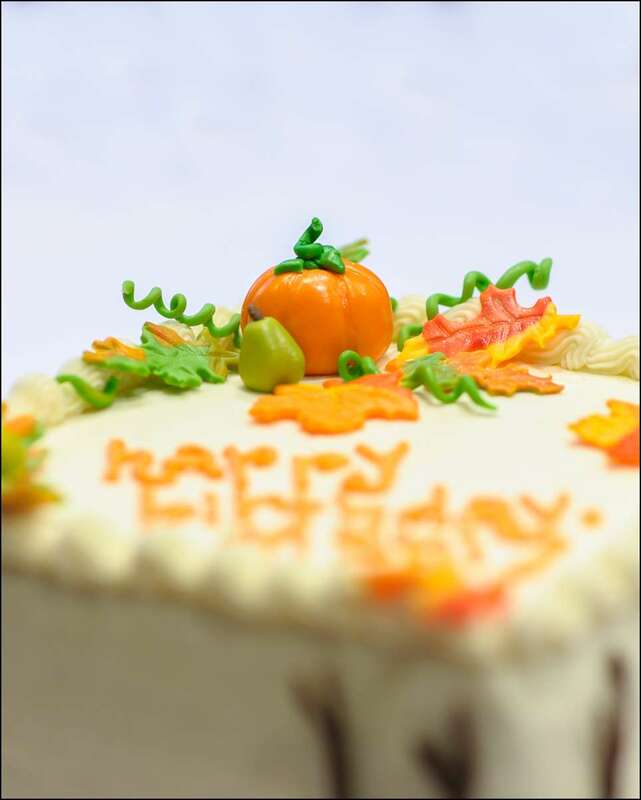 All of the decorations are made from homemade fondant except for the sticks, which are modeling chocolate. 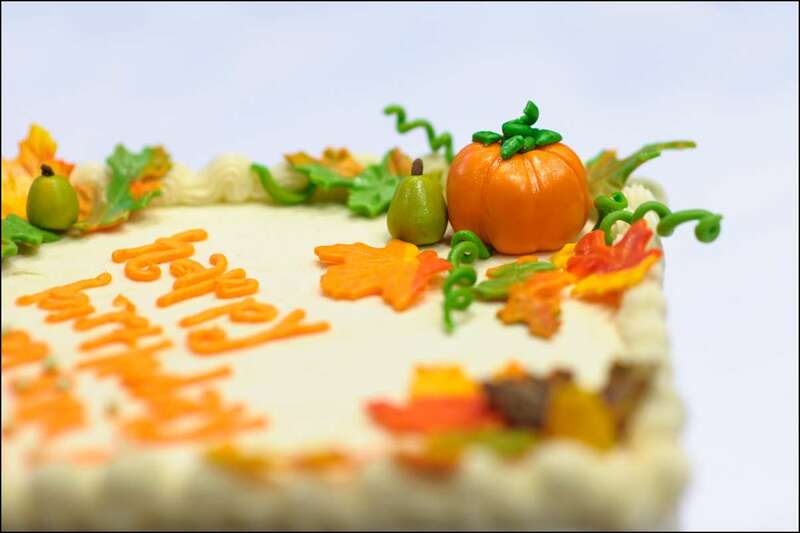 The multi-colored leaves are made by marbling 2 or 3 colors of fondant before rolling it out, giving the effect of fall colors (as my daughter collects them constantly, I’ve studied many fallen leaves over the weeks!). 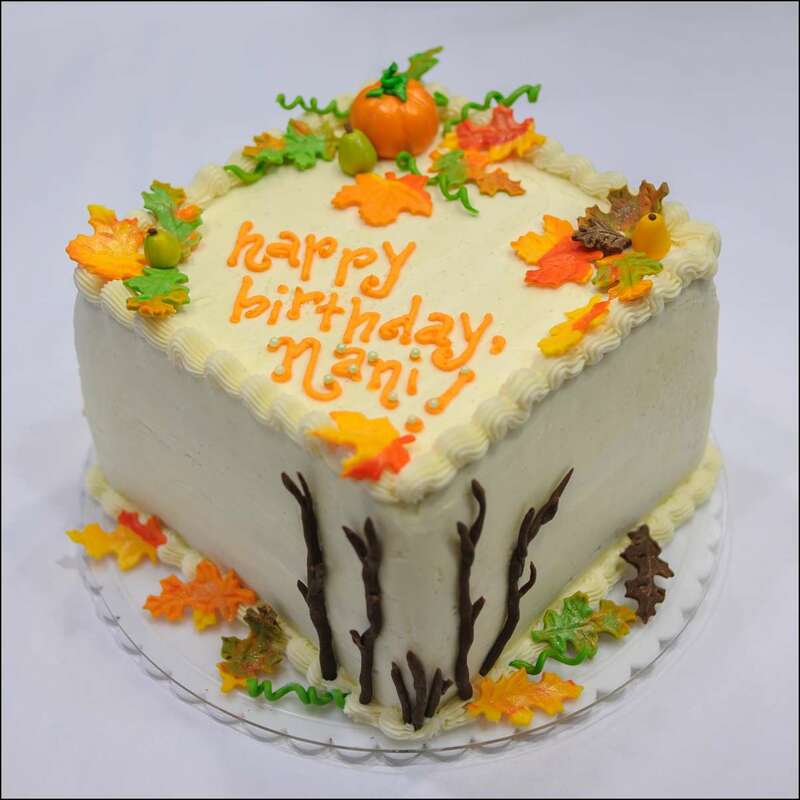 Happy birthday, Mom, I hope you enjoy your special cake…It definitely was made with love! 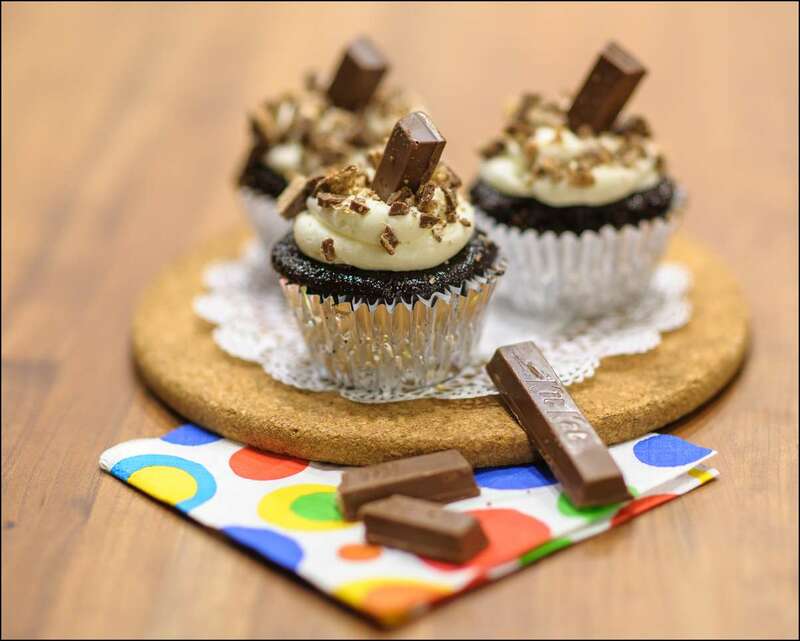 I got the idea for this cupcake combo from my favorite inspiration website, Cake Central. 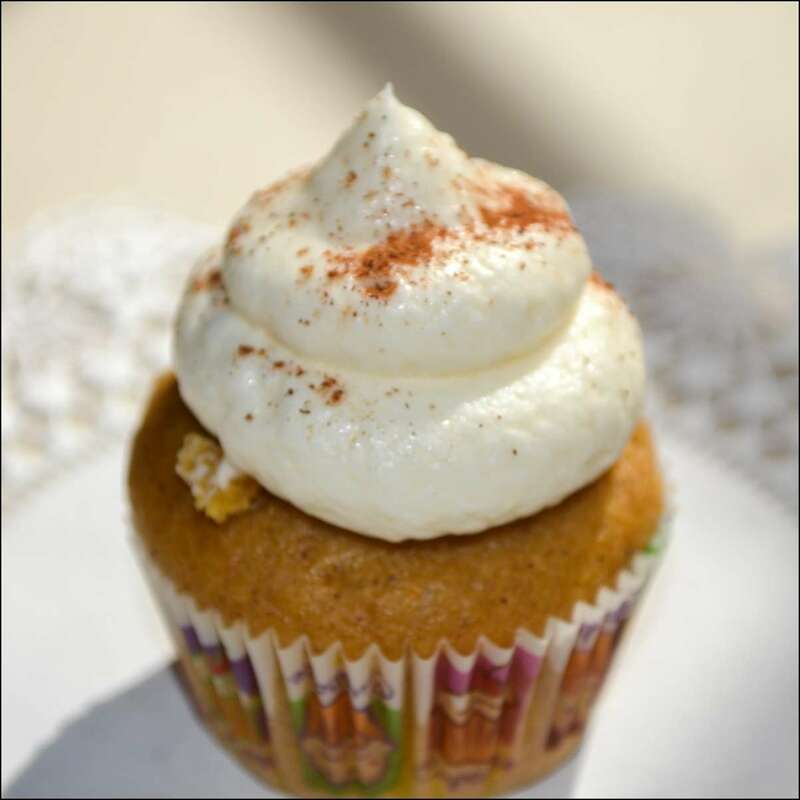 The cupcake is a delicate, light pumpkin spice cake filled with a lightly sweetened latte whipped cream (made with stabilized real whipped cream, flavored with expresso–yum! 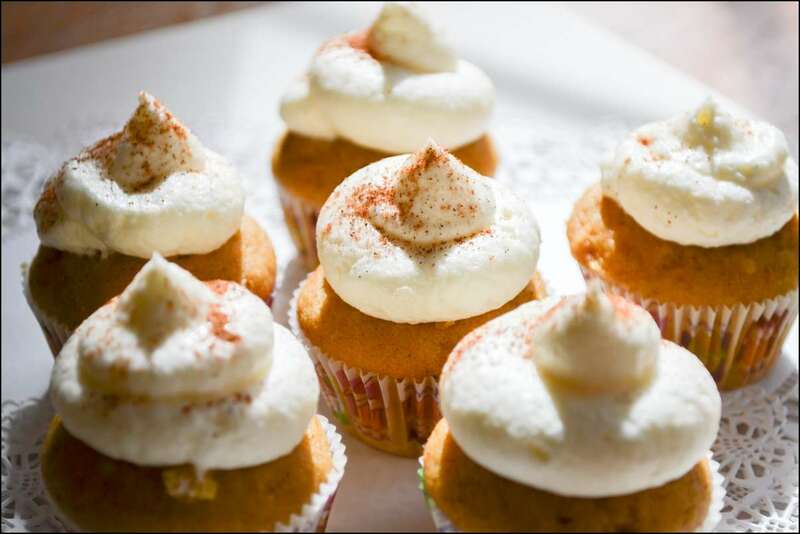 ), then topped with a vanilla-bean cream cheese frosting. 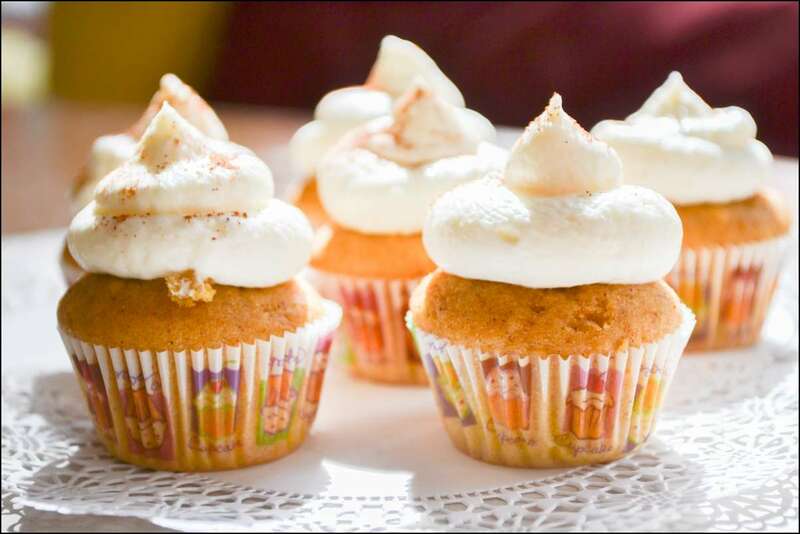 The cream cheese adds a perfect zing to the warm spice of the cake and the creamy sweetness of the filling. 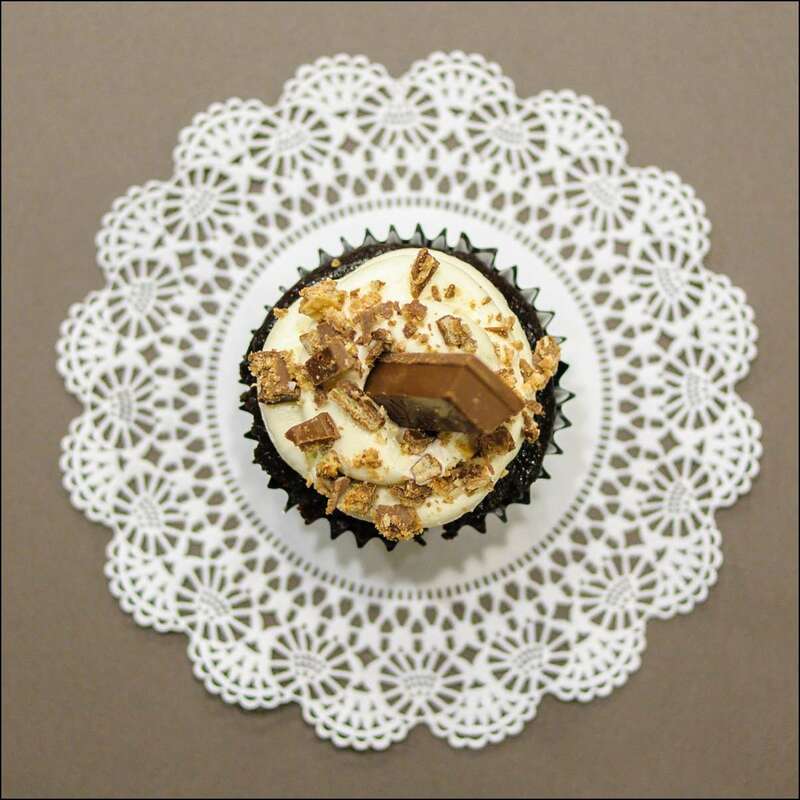 When you crave your favorite pumpkin latte drink this time of year, sink your teeth into one of these! Okay, so my kids talked me into buying a family-sized bag of Kit-Kat bars the other day….really? Family-sized? Who needs that much candy?! And it’s still 3 weeks until Halloween! But, of course, in a moment of weakness at the grocery store, I gave in. 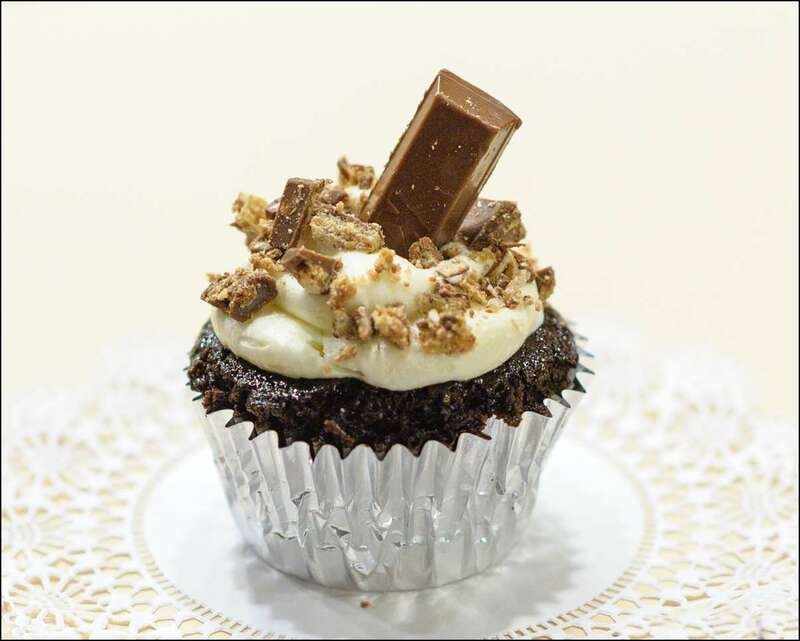 Zero will-power…none at all, ZIP! 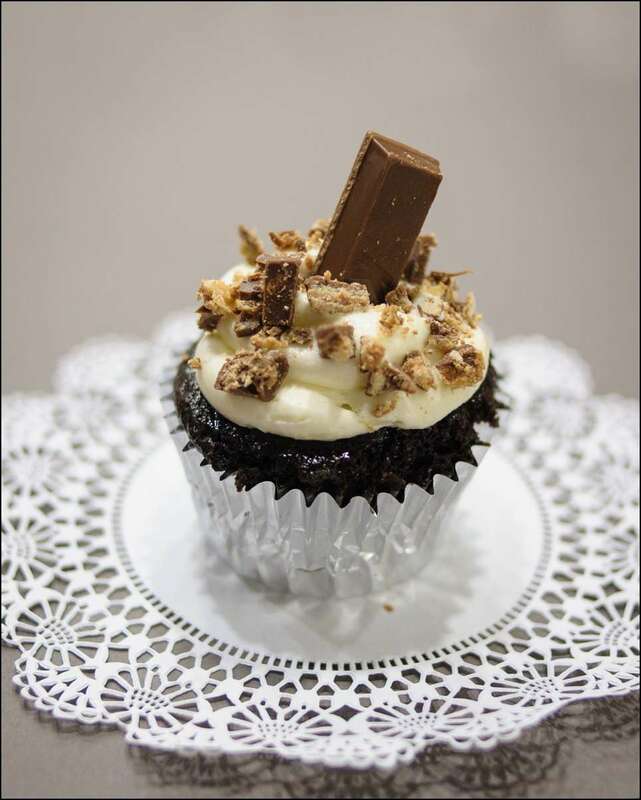 Anyway, after looking at the bars staring at me in the face every time I opened the cupboard, I decided to make cupcakes out of them!